Preheat oven to 350 degrees Fahrenheit. Line a large baking pan with foil. Wash the kale and spin dry in a salad spinner or blot dry using paper towels. Kale must be completely dry or it will not crisp. Trim the stems and cut away the thick inner stem that runs up the center of the kale leaf. Discard stems and roughly tear leaves into chip-size pieces. 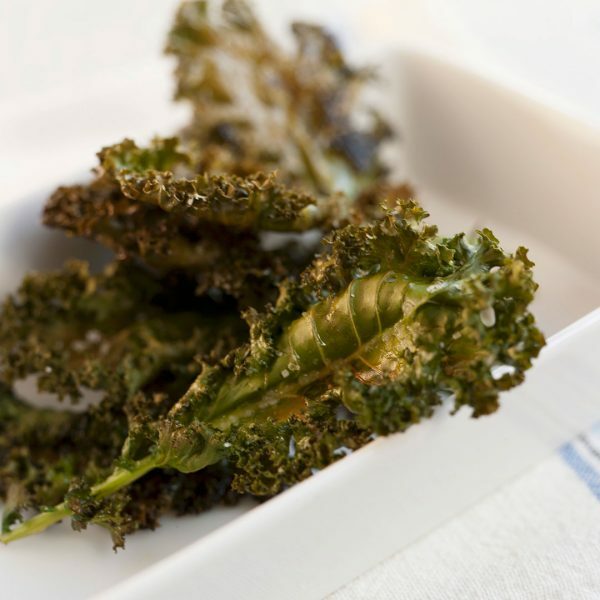 Place kale on foil-lined baking sheet; drizzle with olive oil. Using clean hands, mix oil into kale until all of the pieces are coated. Arrange kale in a single layer and season with salt and pepper. Bake for 12 to 15 minutes, or until crisp. Watch closely and do not over cook, as kale will be bitter. Kale should be crispy and crackly but not browned.